in ALL caps: Wu are you? A few weeks ago I was pointed to a website by a friend who shares my love for the band Fugazi -- shoutout to Gushy V for the tip. I clicked the link and was suddenly very excited. 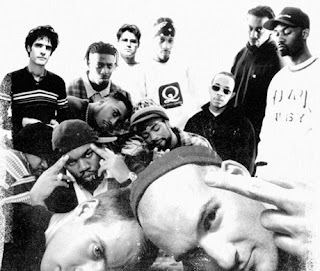 It turns out a couple guys thought it would be a good idea to mash Fugazi with the Wu-Tang Clan. It was one of those "why didn't I think of that" moments, except that I don't do mash-ups and probably don't know Wu-Tang as well as I should. Beyond that I totally should have come up with the idea first. Anyway, the project is fittingly called Wugazi. "Sleep Rules Everything Around Me" was the first track I heard, as the full album hadn't been released at the time. It almost acted as a leading single, particularly since it uses one of Wu-Tang's better-known tracks, "C.R.E.A.M.," on the lyrical side. I was impressed enough to keep an eye out for the album release, though I felt the track wasn't the strongest representation of Fugazi. I hoped for more. The rest of the album, sadly, leans more toward pretty decent than great. The trick, as I gleaned from that first listen to "Sleep...," is to make sure you capture the essence of Fugazi. Too much chopping or simply swiping great basslines doesn't really fit that bill. Too often I feel like we're left with Wusomethingthatisn'tquiteFugazianymore. It's still worth a few listens and it's an impressive feat, but it just leaves me wanting something a little more. Props to the creators, regardless. I totally repect your vision and hope everyone here will listen to it and send you money to keep working on creative projects. The album can be downloaded or streamed from www.wugazi.com. The other album I've had on repeat lately seems to be a symptom of the summer weather we're finally starting to see here in Portland. When the warmth gets here it's time for Pimm's #1 and ginger, lots of oscillating fans, and smooth music to drive to. Right now that last item is Curtis Mayfield's Super Fly. It's somewhat likely you already know this album but in case you don't: this is Mayfield's soundtrack to the film with the same name. Isaac Hayes may have won the Oscar for his work on Shaft, but the funk Curtis brings on this album puts that to shame. It's mellow. It's cool. It has the perfect grooves for cruising in the hot sun. It says "hey man, I'm hep and I've got nothing to prove." Just like me. Just like you. Here's my favorite track from the album, "Pusherman." Be cool, my people. And check out that Pimm's link if you haven't had it before. It is seriously the best summer drink of all time. OF ALL TIME!